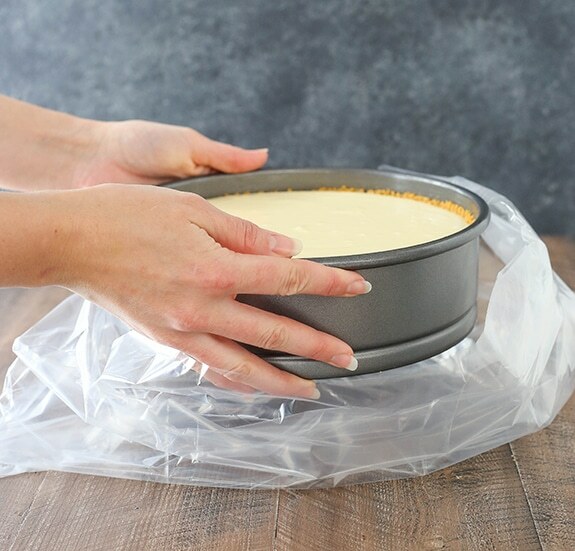 7 easy steps that will prevent your cheesecake water bath from leaking. 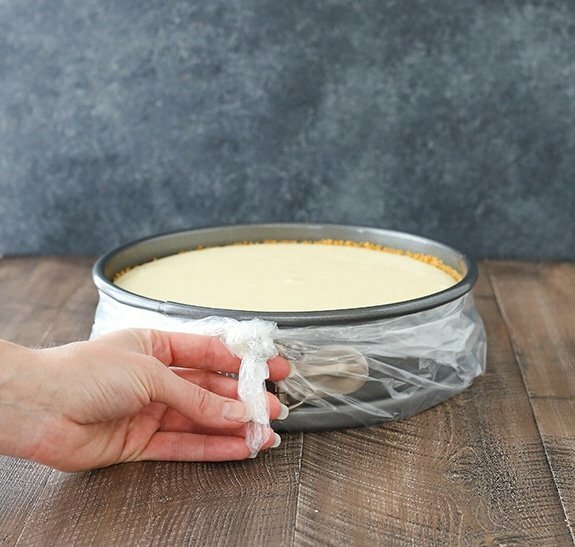 Make a beautiful, creamy cheesecake with no cracks using this simple water bath method. 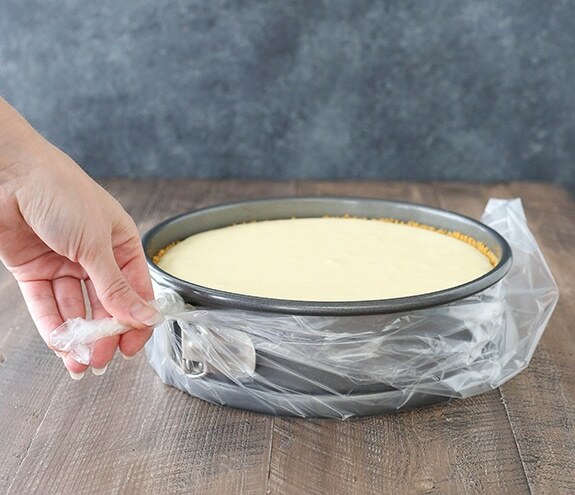 Today I am discussing a very important topic – how to prevent your cheesecake water bath from leaking. Water baths are totally necessary with cheesecake (at least most of the time), but boy are they a pain. Why do I think they are necessary, you might ask? Well often without one a cheesecake will brown around the edges, be a little drier, fall in the center while cooling and most likely crack. I prefer to avoid all of those things, so I use a water bath. If you are cool with cracks and such, by all means avoid the water bath. But if you’re using the water bath, leaks aren’t fun. And have you ever met a springform pan that doesn’t leak? Because I haven’t. Fortunately I discovered a little secret a few months ago and today I finally am sharing it. Ever since then, I’ve yet to have a water bath leak. It’s the best. So let’s just go ahead and walk through the whole process of baking a cheesecake, beginning to end (secret included). Step 1: You need a springform pan. You may totally be rolling your eyes at me right now because, duh. But not everyone knows that and not everyone knows what one is. My mom was one of those people just a couple short years ago. So for those who aren’t aware, this is a springform pan. The bottom is removable and it’s got a spring on the side that releases. Step 2: Line the bottom and grease the sides of the pan. You don’t have to line the bottom, but it’s what I do. It keeps the cheesecake from sticking to the bottom. Occasionally I remove my cheesecake from the bottom of the pan when I put it on a cake stand and lining the bottom allows me to do that successfully. Greasing the sides helps the crust to not stick to the sides. Step 3: Make and bake your crust. I’m not going to go through the whole crust process today, but here is what mine looks like all baked and ready to go. Step 4: Add your batter to the pan. Another “duh” moment, I know. No tricks here. Step 5: Slow cooker liners! My secret sauce! These little baggies are made to stand up to liquid and high heat in your slow cooker, so why not use them in your water bath?! It’s the best ever and NEVER lets water through. Now let’s talk for a second about why this is necessary. We know we don’t want our water bath to leak, but WHY DOES IT?! Well aluminum foil, when folded and crinkled around the pan, gets teeny tiny little tears. You can barely see them, but they’re there. And the water knows it and gets through. Plastic bags don’t have this problem. The only thing to deal with is the fact that these suckers are big. Much bigger than we really need. So here’s what you do. Spread it out on the counter. Place your cheesecake in the center. Grab all that excess baggage and wind it up. Tie that sucker in a knot. Try to keep the top of the bag right under the rim of the pan, just to be sure no water will get through. I add my aluminum foil for double coverage. The foil can more easily be molded to come up over the edges of the pan, further assuring that no water gets through. I do trim off the corners of the foil. So much foil. Step 7: Set your cheesecake pan inside another larger pan. You can use a roasting pan or whatever works. I happen to have many rather large cake pans around so I use one of those. I don’t have photos of myself adding water to the pan, but that’s next. You want to fill in the space between the pans with warm water, then bake. Once the cheesecake has baked, it’s time for the big reveal!! Would you look at that?! Totally dry!! Not a drop of water on that baggie. And there wasn’t a single drop on the cheesecake either. I don’t have the finished photo of the cheesecake to share because the cheesecake in the pictures is actually from the cookbook I’m working on so it’s a secret. I share one, I keep another. You’re welcome. 🙂 The important thing is – look at that dry bag!! SO DRY! I hope you found that helpful! Now time to bake a cheesecake! That is an awesome hack, Lindsay! Seriously, I never woulda thunk to use my excess baggage that way. 🙂 No leaky cheesecake means happy times! What a great hack……. 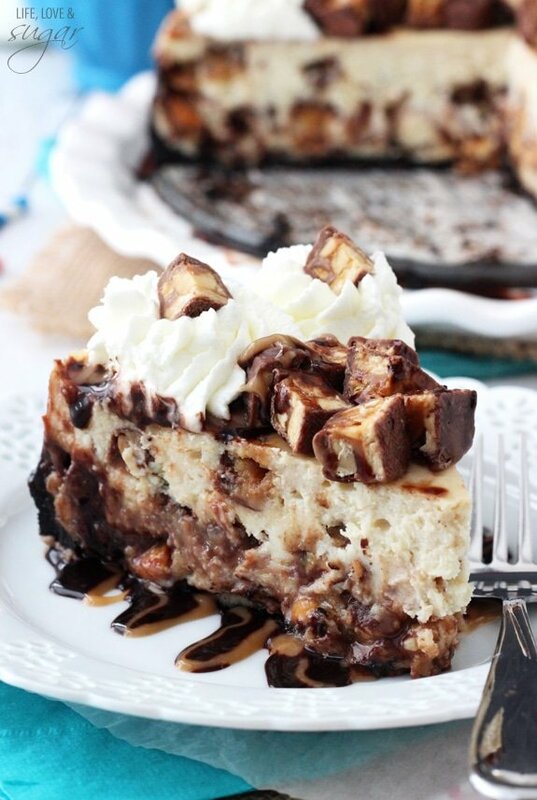 maybe it’s time to make more cheesecake! I have found that when I do the water bath that I have alot and melted butter leaking from my crust. What could be causing this? Possibly putting too much butter in my crust?? If there is a lot of butter, I’d try reducing the amount of butter a bit. I make a lot of desserts (cakes & cheesecakes) for church bake sales. The week before the scheduled bake sale is too busy to get all baked I want to. 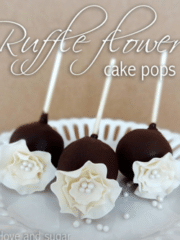 I would like to make several but time limits dictate how many I can get done that guarantee freshness. 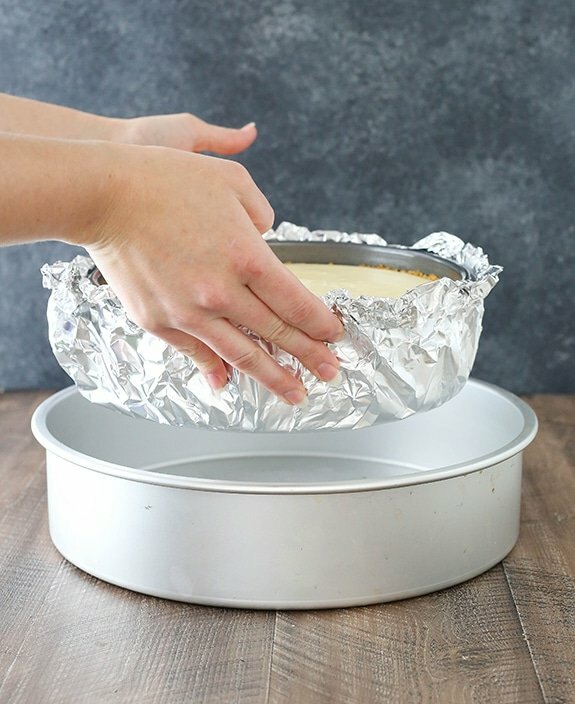 Do your cakes/cheesecakes freeze well? Can you give me tips/suggestions? I don’t personally do a lot of freezing. If you want to freeze layer cakes, I’d recommend freezing the layers, then building the cake before using. 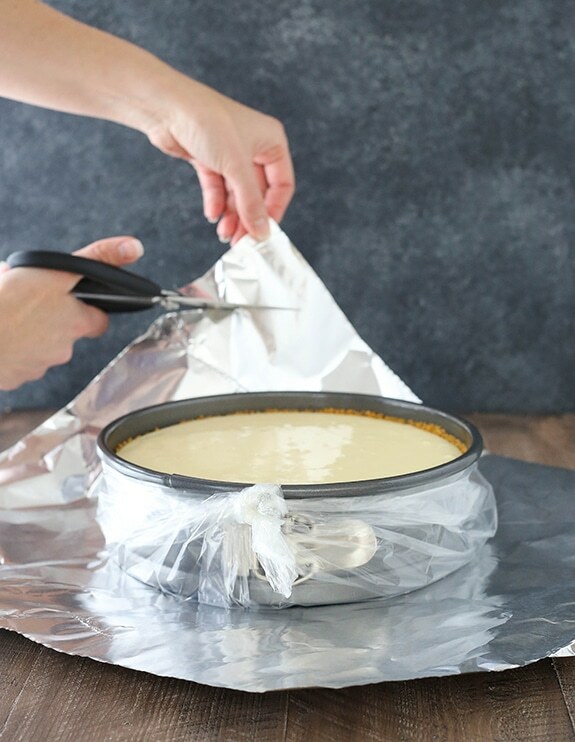 To freeze cake layers, I wrap then in clear wrap, then aluminum foil and defrost them in the fridge. Cheesecakes I have less experience freezing, but would likely use the same method. Really nice ! Never thought of this ever. Appreciate it. Thank you for sharing this tip. I stopped doing the water baths because of the leaking. How much water do you recommend pouring in between? 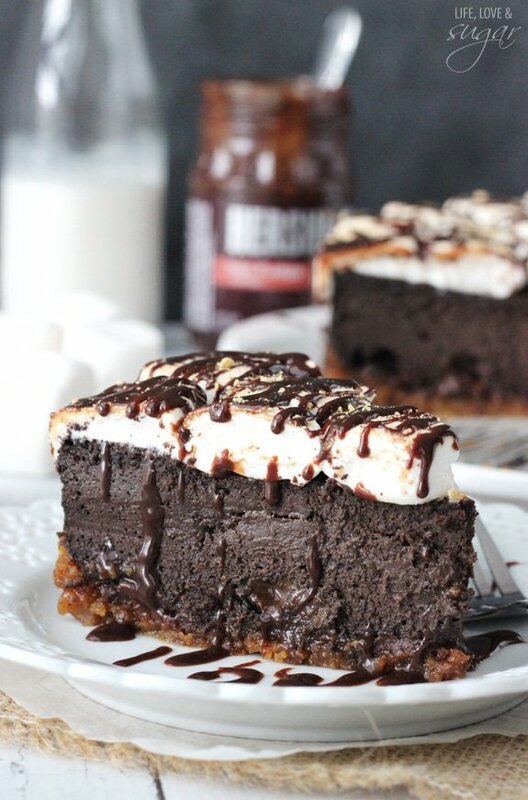 Would the size of the larger pan affect the cheesecake in any way? I usually fill a little more than halfway up the side of the springform pan. A larger pan shouldn’t affect it. I had the same problem with 2 cheese cakes today but got water in them…. It 1 in the morning and I them later today… Any other tips?? Can they collect water due to sweat? I wouldn’t think they’d collect sweat, unless there’s already a little water in there. Perhaps there was a hole in the bag or the water was a little high and went over the top? Water wouldn’t go through the plastic, so it must’ve gotten around it somehow. Hi Lindsay…I had the same problem. About 1/4 cup I’m guessing. I was really careful to the the plastic nice and tight. Even using binder clips to secure it. And heavy duty foil around that. Any ideas? Would love to hear back from you. Thanks. There shouldn’t be any leaking through the bags, unless they have a hole for some reason. The only way for water to get in would be going over the top. Definitely make sure it’s securely in place and high enough on the sides of the pan for water to not get over the top. 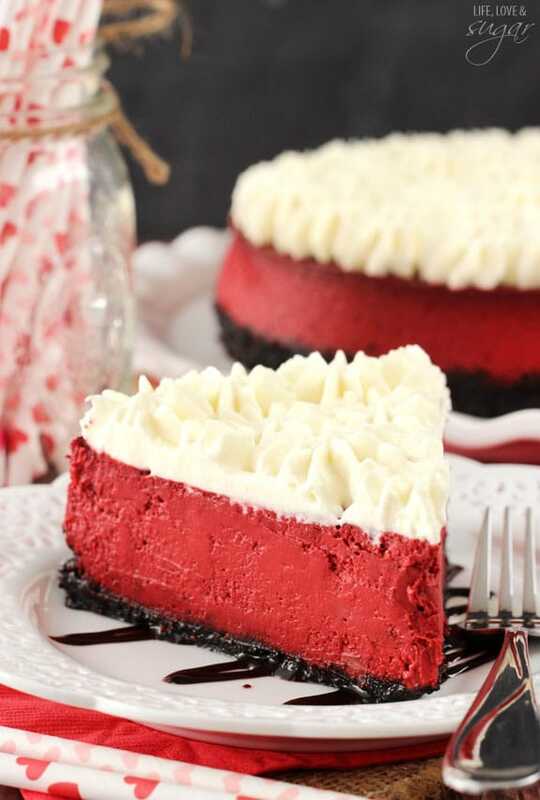 I tried this out on New Years Eve afternoon while making a white chocolate raspberry swirl cheesecake and it worked perfectly and was so easy. Excellent tip! 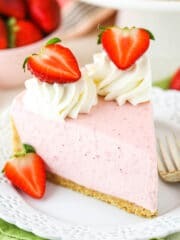 I am a huge fan of cheesecake- I even have Junior’s original cheesecake recipe, made it so many times, I know it by heart! 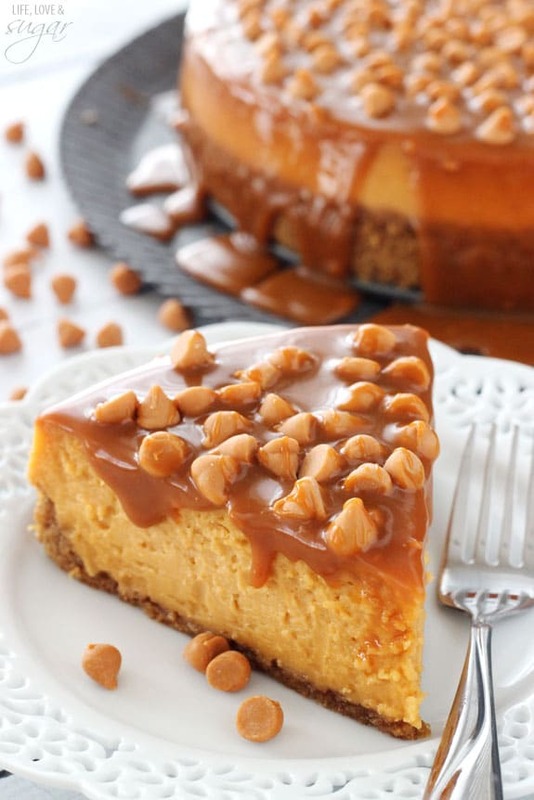 I downloaded 300 cheesecake recipes from Ebay years ago, and have picked my favorites. 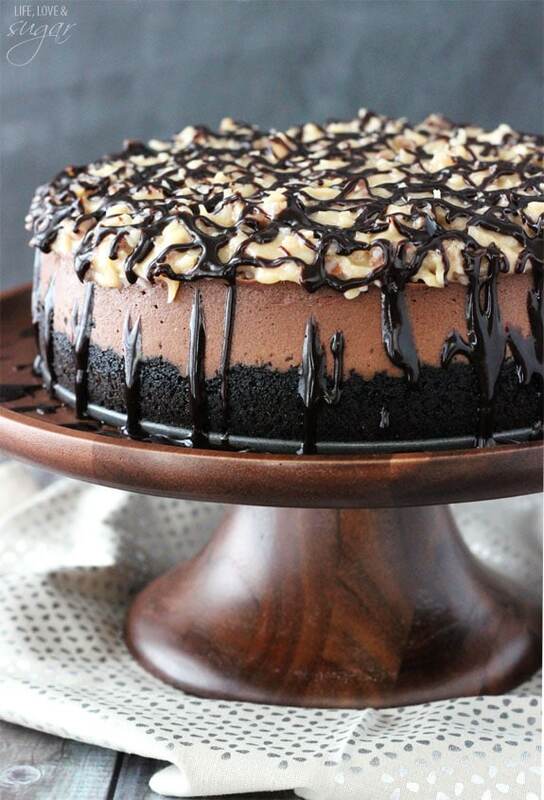 I’m always looking for chocolate cheesecake recipes in particular. I had one years ago that called for almost 3 pounds of chocolate, and lost the recipe. Talk about decadent! I’m glad you’re finding the site helpful! 🙂 I do love a good cheesecake. 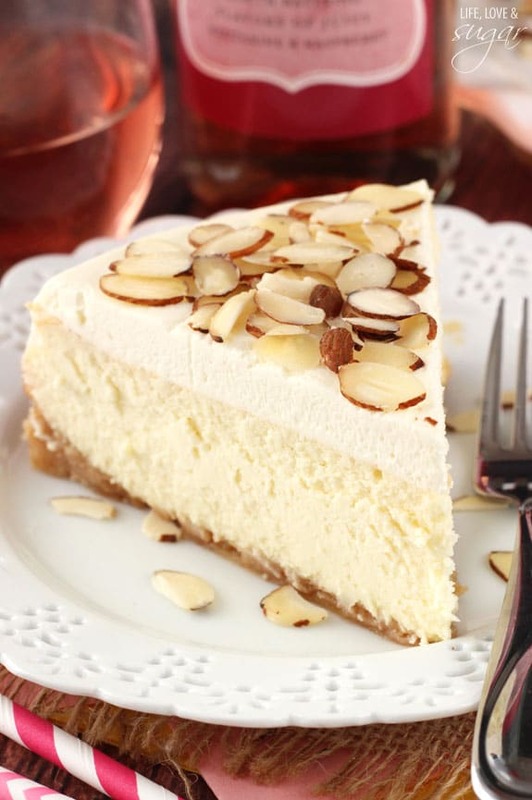 Here’s a vanilla cheesecake that is a great option. I used some vanilla bean in it, but you could just use vanilla extract if you want to keep it simple. I feel like I just stumbled on a treasure! Thank you SO much for your site! 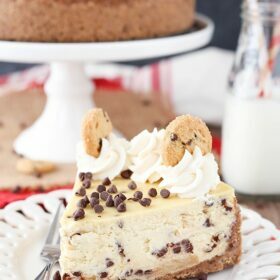 All the cheesecake recipes look great! Can’t wait to check into more of your recipes and ideas! God bless! Awesome! 🙂 Thanks Mary! 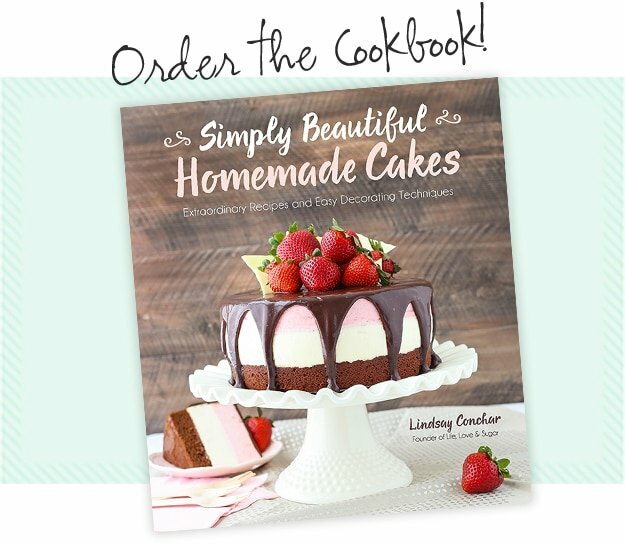 I hope you enjoy the recipes! You saved my life! I was so frustrated with it always leaking. Thank you! 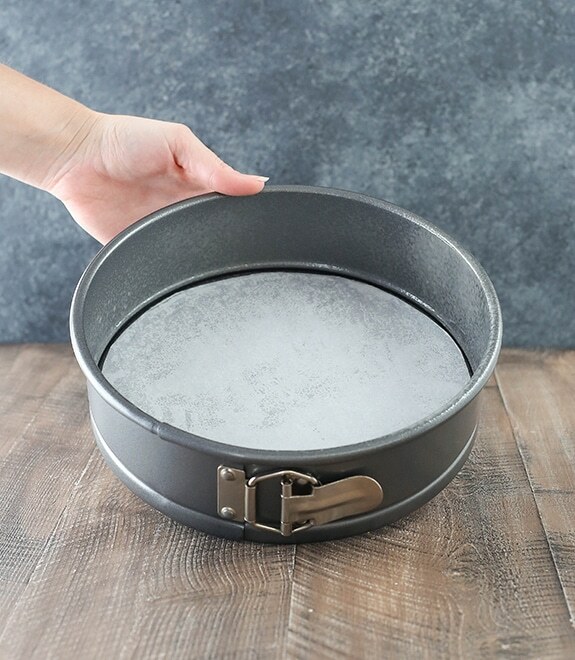 What size cake pan would you use to hold a 9 inch springform pan? 12 inch? 11 inch? Thanks! I use a 12 inch. I usually only use them once, but they look like they could handle a second use. I found the Reynolds 6 bag on line as an add on for only $2.95. I ordered them immediately, as I was ordering some stuff anyway. I have a question, how many times can these bags be used? I figured that they must be sturdy enough to use in a slow cooker so I figured they must be sturdy enough to use more than once if used with care. I usually just use them once, but they seem like they could probably be used at least a second time. use oven bags often but never thought to use it for this purpose, definitely will next time. MMMMMM.. I’m SO hungry now and I didn’t NEED to see these cheesecakes. 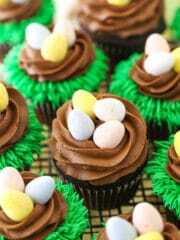 (I think I’ve gained ten pounds just looking at them!) Going to start with the first one and work my way down. If I’m going to gain ten pounds, I may as well do it EATING the cheesecakes instead of just looking at them, lol. Oh, heaven…. Hi we don’t get those bags in South Africa is there something else I could use! I’m not sure of what’s available there to be able to say if you could find another option. I’m sorry! Thanks so much I made a plan. Made the lemon cheesecake twice now once for my daughters 18th birthday! Took it out to my guests and when I came back it was all gone. So didn’t get to taste it! So I made it again yesterday so that I could also taste it. Best baked cheesecake I have ever eaten!!! Thanks so much for sharing this with us. Great idea! 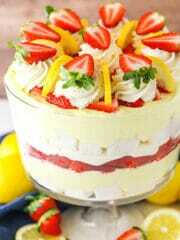 Looking forward to making one of your cheesecakes for DH’s birthday this weekend. I have a question-is the bag ok to reuse? Can it be used again to make another cheesecake or can it still be used to line a crockpot for another recipe? Always looking for ways to not only make the best product, but also to be economical. Thanks for all of your recipes-they are such an inspiration! God Bless you and your DH and your upcoming family! They could probably be used a second time. Thanks Lindsay! I made the cheesecake for DH’s birthday today and it was a HUGE hit! Directions were spot on-first cheesecake I ever made that didn’t crack! I did end up having to cut the plastic bag off but it worked like a charm to keep the cheesecake from getting wet in the water bath! 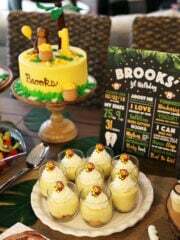 Thanks again for making his birthday special by sharing this recipe! Blessings to you, your hubs and the babies! Apparently you are the cheesecake queen! 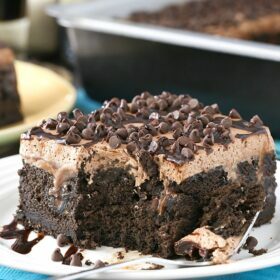 I found your “chocolate lovers cheesecake” on Pinterest. I’ve been making cheesecakes for 45 years & I still can’t tesist a cheesecake recipe! 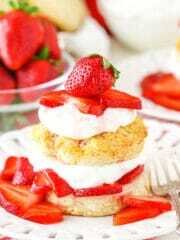 I’ve made my share of difficult cheese cake recipes, but this looks yummy & easy. In the beginning I never used the “water bath” method, but the last few years & Food Network have convinced me to do so. I like the “lining” idea you demonstrate & will use it. My question is do all your recipes call for the water bath? Thank you. I’d say just about all of them do, unless they are no bake. There may be one somewhere that doesn’t, but I do prefer a water bath. Can’t wait to try this trick, thanks! One question, sorry if I’m missing it- what exactly are you lining the bottom of the pan with? The inside of the pan has a parchment circle in it – is that what you’re referring to? 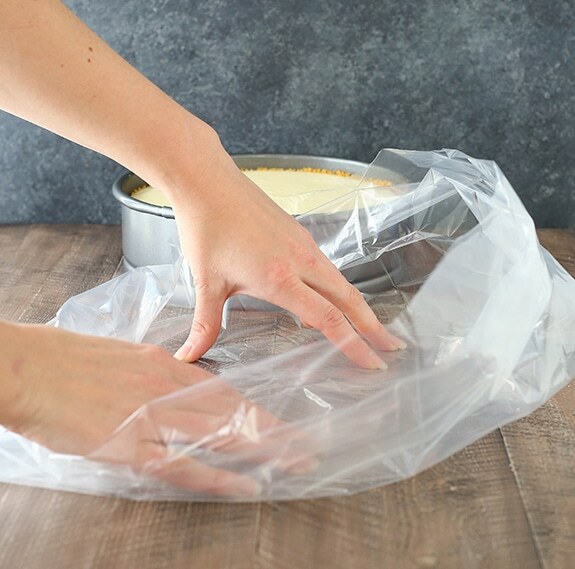 Can we reuse the bag for the next cheesecake? God bless you, Lindsay. I’ve been thinking there HAD to be a hack, but hadn’t found anything fool-proof. Thanks! OMG OMG OMG!! This is amazing!!!!! I just baked a cheesecake today and was so sad to see the dreaded leakage AGAIN! So, I went on the web to find out what is going on! E Voila! I found you! Ordering a ton of these bags from Amazon!!!! Ciao from Italy e grazie ancora!!! I’m so glad you found the tutorial. Leaking pans are the worst! Thank you!!!! You are a genius???? Lindsay, have you thought about trying turkey bags instead of Crock-Pot bags?? They come in different sizes, so you might be able to find a smaller one that works better. 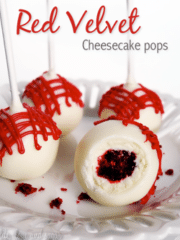 I love this idea, I’m totally going to try it next time I make a cheesecake. I’m not sure I’ve seen turkey bags. I’ll have to look for them! Perfect! 🙂 I hope you enjoy the cheesecake! I Love You! I wish I had read this before I ruined my Coconut Cheesecake I was making for Christmas. And I have those bags too! Sorry to hear about the coconut cheesecake! I hope you get to try this method another time! 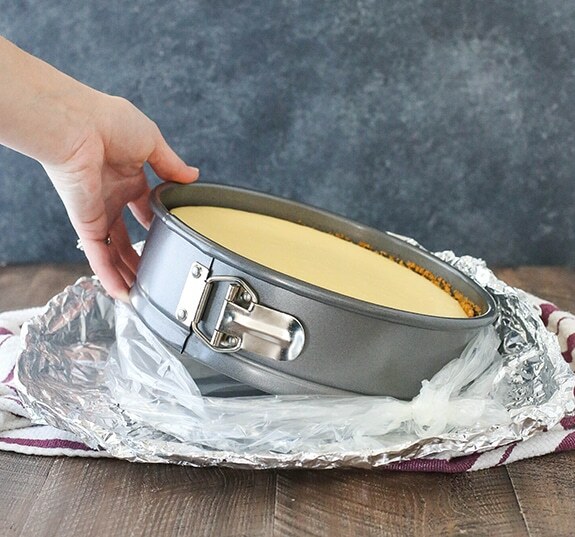 Lindsay, since the springform pan is in the cake pan can’t you forgo the bag and foil and place both in a roasting pan filled with waterbath? This is so late, but the point of the bag is to keep water out; not, to keep the batter in. 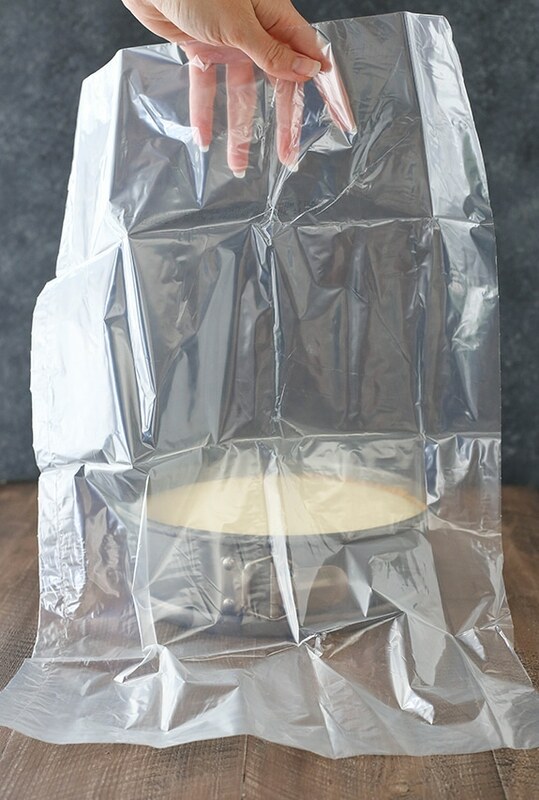 The bags are a neat trick but, what do you recommend to stop the cheesecake from browning so much? My plain cheesecake looked like a chocolate one on the top and sides. 🙁 but, it was still yummy. It was the first one I’ve ever made. Did you use the water bath for the cheesecake that browned? I find that it a water bath isn’t used, browning often happens. Thank you so much for this information! It is exactly what I was looking for. It is terrible to have worked to make an awesome cheesecake and then have the crust be soggy. This is genius! 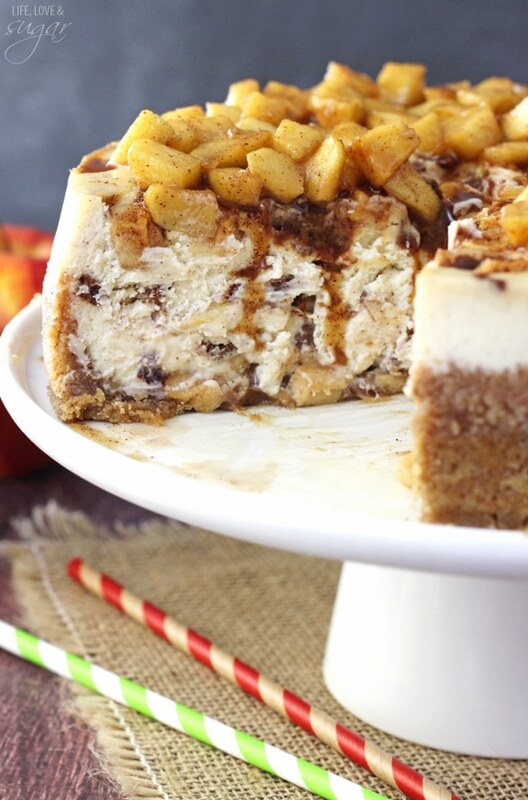 I am making your brown butter pecan cheesecake right now and can’t wait to test this out. 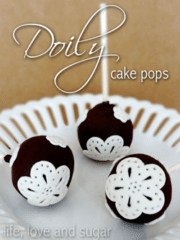 I’ve been baking for years and have never heard of this! Thanks so much for sharing!! 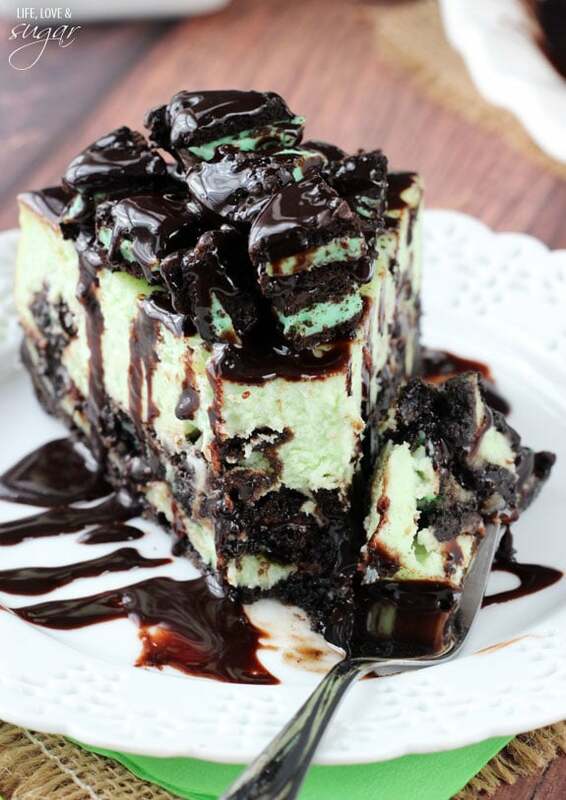 I rarely comment on postsbut, your tip saved my cheesecakes! Thank you! I tried the Crock Pot liner, with 3 layers of foil, several times and it was wet inside the bag every time. 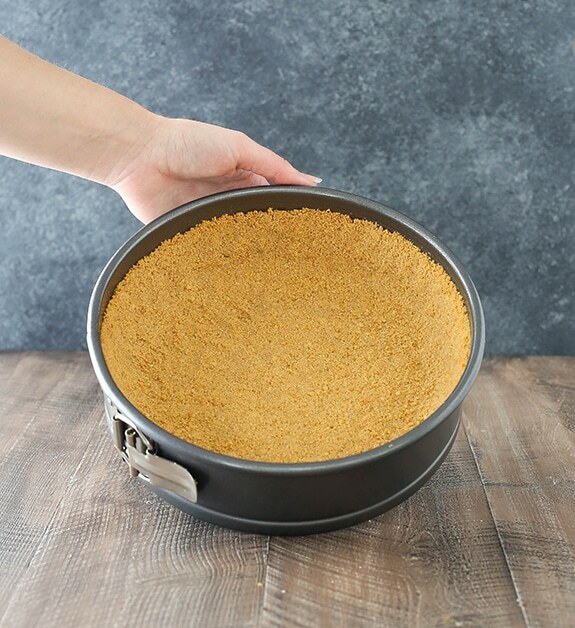 Have you ever used a “moat?” I use a 9-inch spring form pan for the cheesecake, place it inside a 10-inch straight sided cake pan (3 inches deep), then place the 10 inch pan inside a 12 inch pan (3 inches deep) filled with water. Works like a dream! No more foil. No more Crock Pot liners. 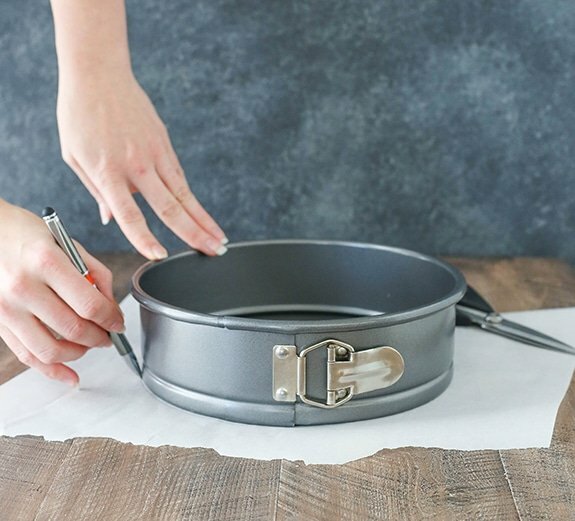 Aluminum cake pans are a one time purchase that will last forever and not a drop of water forms around the spring form pan. All items can be purchased at webstaurantstore.com. That’s interesting! No, I haven’t tried it, but sounds like a great idea. I have the same idea as Thelma. And if that don’t work, I decided to try using a large roasting bag since they can handle water & high temps. Will see if I can find the Crock Pot liner bags if the 2 pan idea doesn’t work. I do this and it works well; no messing with tin foil or bags, and no praying it doesn’t leak. 9” springform placed in 10” cake round. I then place that inside a 12” square or round cake pan and fill with water. Works like a dream. Thelma, this sounds like what I decided to try on my next bake. Made my 1st cc yesterday & water leaked in thru the foil. So bought a deep dish pizza pan to put the springboard pan in. Then put the deep dish pizza pan into a larger pan & will put water in that larger pan. Thus keeping my cc safe from getting wet. I bought all 3 pieces (incl another 9″ springboard pan) at WalMart for $17. Then looked on line to see if I HAVE to have the water right against the springboard pan, which is how I found this page. Thank you for posting, as this now encourages me that my idea will work. And if this wasn’t going to work, I was going to use a large roasting bag to put the spring board in. Never seen or heard of or seen Crock Pot liner bags. Which is also a great idea Lindsay. I know you wrote this awhile ago, but WOW! Total game changer! Also. Have you ever made mini cheesecakes in the pans with a ring that slides out? What is the best pan? Would one hot water bath those? I’m glad you found it helpful! I haven’t made cheesecakes in those mini pans before, so I’m not sure. I’d think one water bath would be fine. 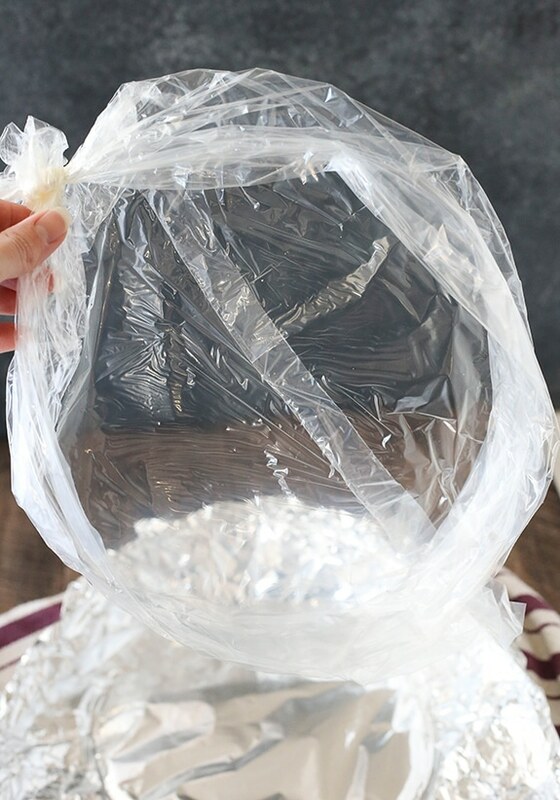 why do you need the aluminum foil, why cant you just do the slow cooker bag? You could probably just use the bag, but I like the extra layer of protection. When using a water bath for a cheesecake should you adjust that bakimg time and how much? I have my great grandma’s recipies and we love it but it usually cracks. Would love to try a water bath. 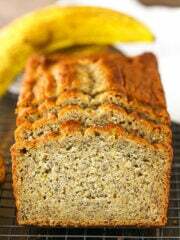 It’s hard to say without knowing anything about the recipe or trying it. Generally I’d say baking time would vary by maybe 15-20 minutes. When using the water bath do you need to adjust the cooking time? You usually do, but it might depend a little on the cheesecake how much. I’d be cautious to say how to adjust something without knowing anything about the cheesecake recipe. Generally, it might vary by 15-20 minutes. Shut the front door!! Why didn’t I think of this? I just ordered some of the bags on amazon and will be trying this tip this weekend. I own several springform pans, from the cheapest $8 pan you can find at walmart to a couple of $50 pans from some name brands. They ALL leak, to varying degrees. I will admit that my $50 pan leaks significantly less than my other pans, but there is a small gap right where the latch closes and it leaks very slowly just in that area of the pan, compared to my other pans which seem to leak around the entire perimeter. Will report back my findings after I try this!!! Thanks so much for sharing! So glad you found the tutorial! I agree, all these pans leak. I hope it worked well for you! I’m so glad the tutorial helped. I hope you enjoyed the cheesecake! Ok. So i’ve been using this method for awhile with my cheesecakes and they have been coming out perfect. So on to the next challenge. 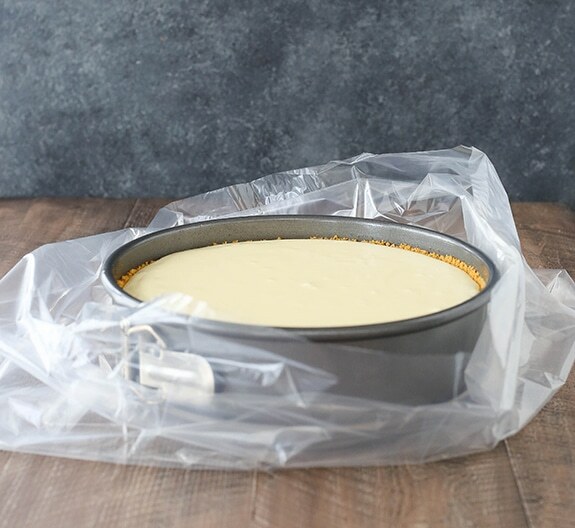 I am starting to use the 4″ spring-form pans for smaller cheesecakes, but there are no small sized oven bags. I’ve tried the aluminum foil wrap and have never had success in keeping my crust dry. 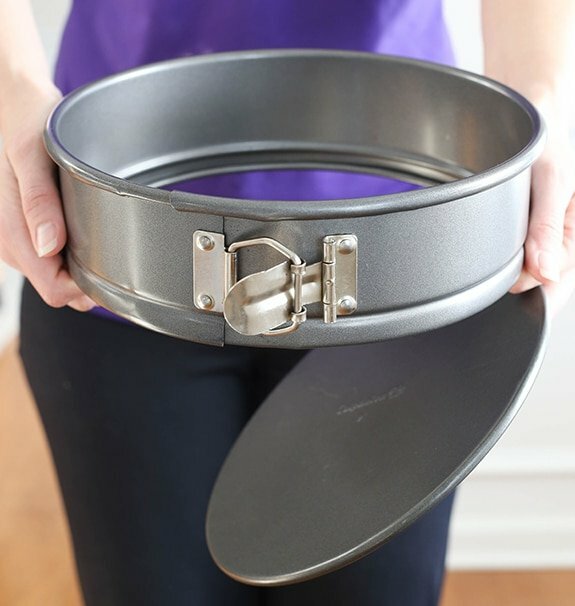 Does anybody sell a small oven bag that would closely fit the 4″ pans? I’m so glad to hear it’s be working for you. I don’t know of any smaller sized oven bags. Could you trim down the larger ones? Wonderful! 🙂 I’m so glad it was helpful! I never had one leak until recently and I think it might have been my foil being left out in the rain. But I wasn’t taking any chances on the cheesecakes that auction at the church for $300. However, I always have butter leaking out of mine so I learned to put a pan underneath to save cleaning the oven. Pumpkin cheesecake s need a water bath or the texture gets weird. When I opened the plastic bag it was soaking in the butter which is better than water. Have you heard of this happening and do you maybe have any suggestions to do a better crust. If it’s soaking in butter, I’d try reducing the amount of butter a bit. Thank you so much! I despise the water in my cheesecake! Hi Lindsay. I wanted to clarify… I made 2 identical cheesecakes today. It looks like one of my crockpot bags leaked. The other was dry as can be. I will try it again. Thank you so much. Blessings! 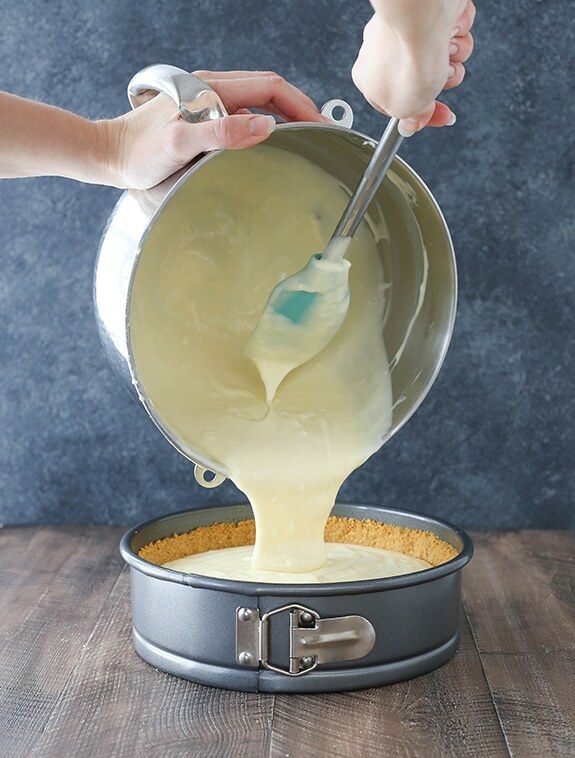 10″ X 21/2″ high silicone cake pan is all you need for a 9″ springform pan liner for cheesecakes. I purchased one a few years back and it works like a charm! no fuss no muss! no water ever gets in my cheesecakes. Really looking forward to baking your frosted animal cheesecake soon for a christmas party! 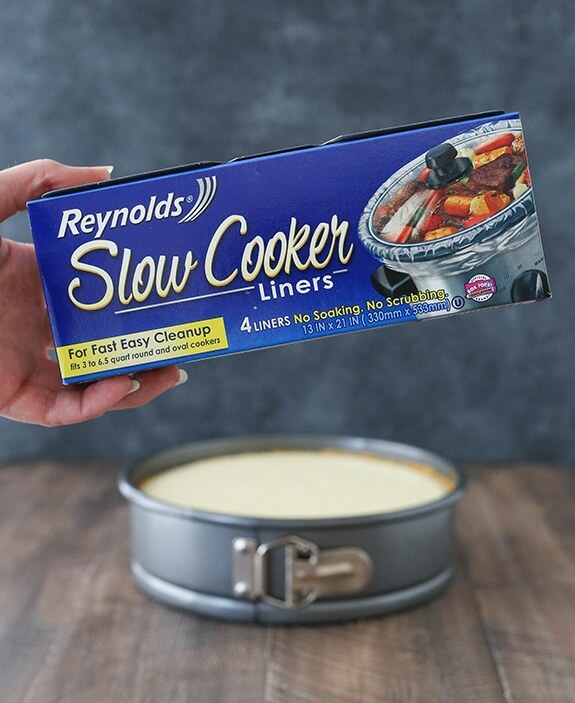 I use the liners to cook my cheesecake. The problem I have is the bag sweats when it sits in the oven to cool after cooking. This is when water gets inside my bag. Any suggestions to the sweat? Hmm, I don’t usually have that happen. It’s normally completely dry. That would be a lot of sweat for it to penetrate the pan. Are you sure there wasn’t some moisture in there to begin with? What a great tip…thank you so much. 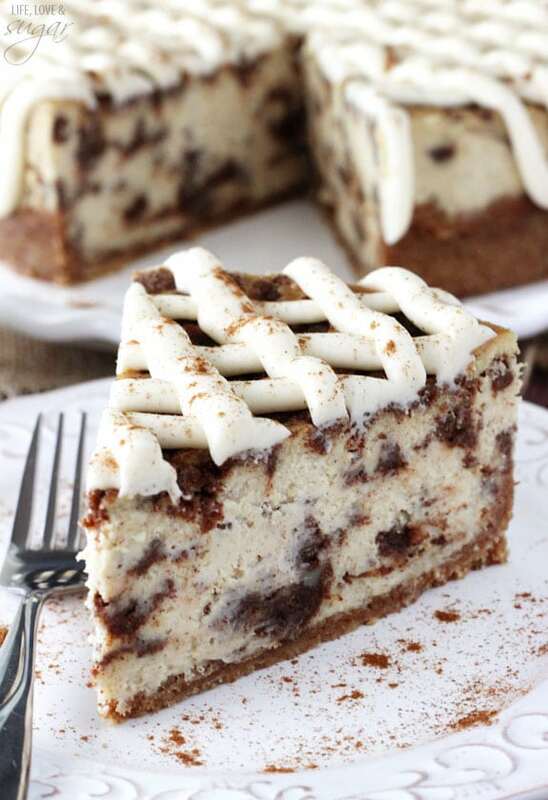 Going to give it a try while make Eggnog Cheesecake using your recipe. Awesome! I hope you enjoy the cheesecake! Merry Christmas! Great idea. 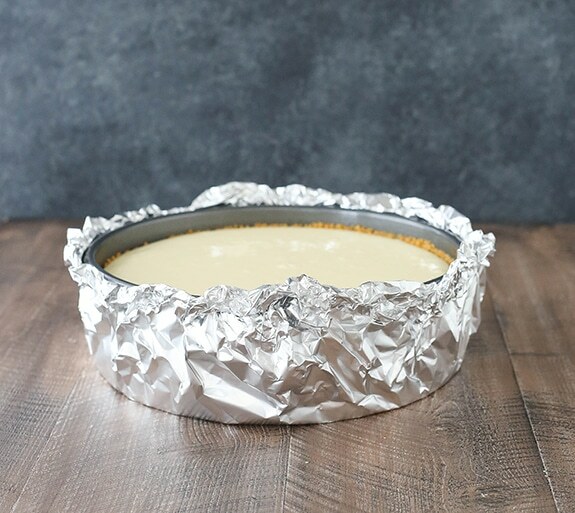 I thought the foil would not fole my cheesecake but it did. Was looking so forward to this . Thanks. I will do this next time and look at all these great recipes. I’m going to put a new crust on the bottom taking the soggy one off. Just in case the previous over 100 thank yous is not enough. THANK YOU!!!! This is genius and I appreciate you sharing this leak-proof idea. 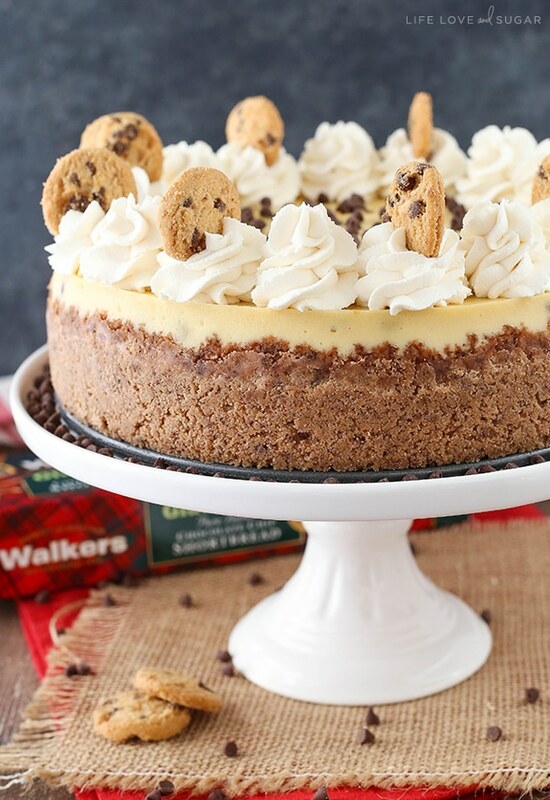 I will be baking more cheesecakes in my future. Thank You! This worked great, I skipped the foil outside of the bag though, and just used masking tape to hold it together outside the pan. Have used it 4 times this month already! Wonderful! Glad it’s been helpful! Made my first cheesecake yesterday. Wrapped the pan in foil. Everything was perfect, except the foil leaked. Went looking for an answer and found this! Perfect! Thank you! I’m sorry your pan leaked, but I’m glad you found this! I hope it helps!